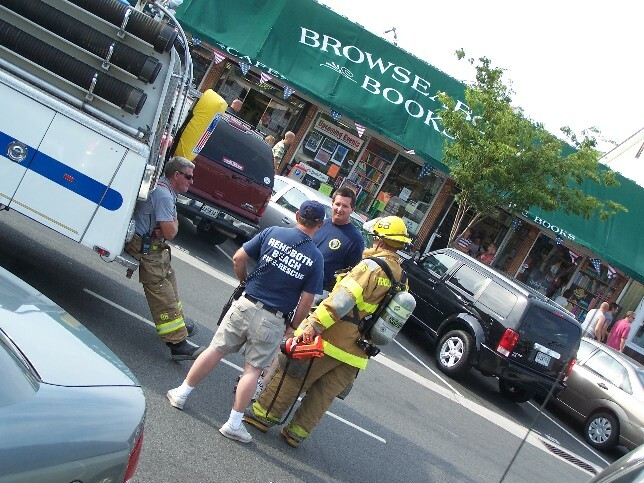 Browseabout Books on Rehoboth Avenue was evacuated Saturday after an odor of smoke was reported inside the store around 5:20 p.m. Rehoboth Beach police directed westbound traffic across to the eastbound side while firefighters searched for the source of the electrical odor (smelled like burning rubber). After firefighters checked the air conditioner, one of them speculated it could be a bad fluorescent light ballast. 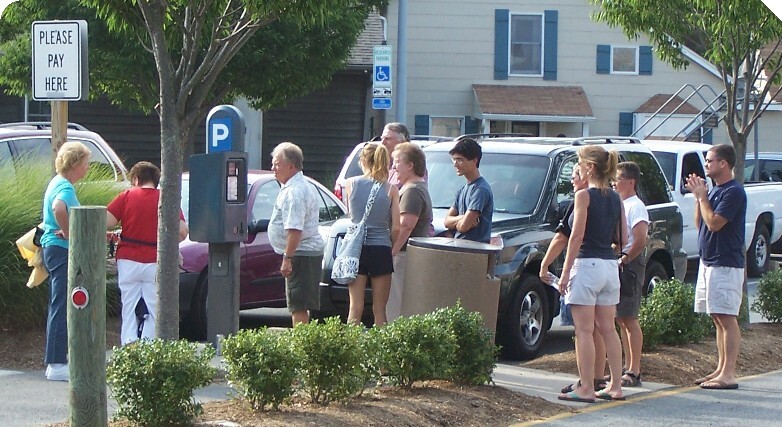 They left around 5:50 p.m. and traffic in the second block of Rehoboth Avenue once again flowed in both directions. Rehoboth Beach police received a call reporting that a man left a weapon in bushes at Henlopen Avenue near Gerar Street, and then left the area around 5:40 p.m. Saturday. When officers arrived, one of them asked the dispatcher if the state police had any crimes reported where such a weapon (possibly a firearm) had been used. The officers' unencrypted radio conversations were vague, but they broadcast a lookout for a skinny man in his 20's with cornrows in his hair, wearing a black shirt and blue shorts. The officers departed after about 15 minutes. Also on Henlopen Avenue, on Saturday morning police investigated several vehicles that had been "keyed" overnight. 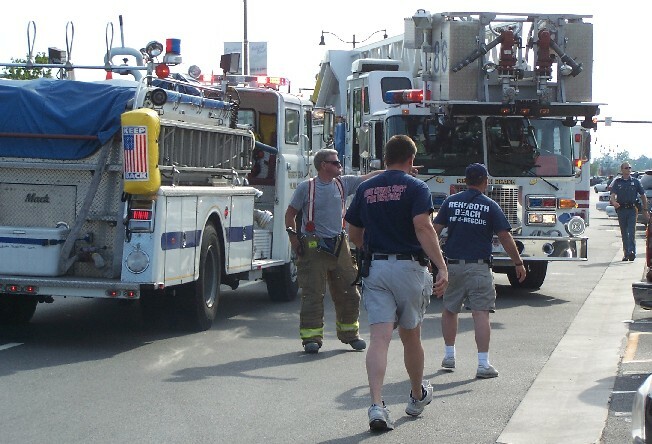 A man reportedly yelled at a Rehoboth Beach lifeguard Thursday afternoon after some beach-goers dug a couple holes off Delaware Avenue. The guard radioed Capt. Kent Buckson with the complaint. The beach patrol's medic found the holes and described them as about five-feet deep and six-feet wide. He asked the teens to fill them. Capt. Buckson stated that he wanted the man who complained to speak to him personally at beach patrol headquarters, or have him apologize for yelling at the guard. He later apologized after the holes were filled. 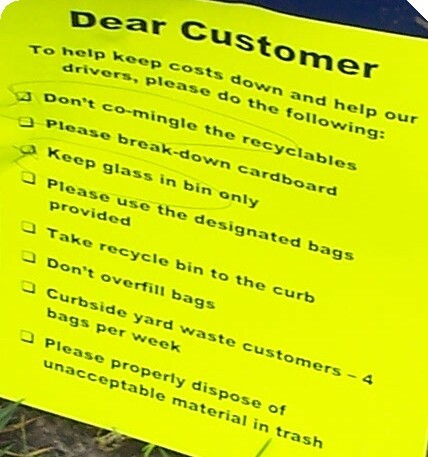 The Delaware Solid Waste Authority declined to empty these recycle bins Friday, opting instead to post yellow notes on them. 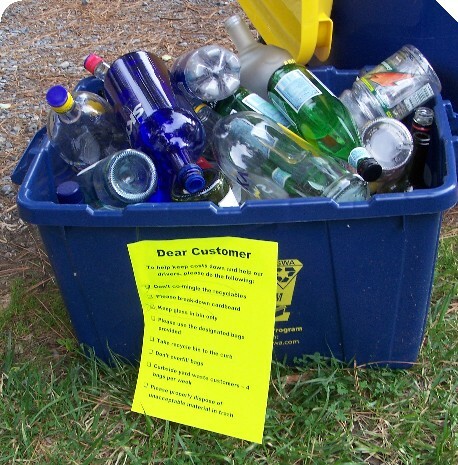 These two containers were in the same block on Henlopen Avenue, but the DSWA has been posting this note throughout the city. 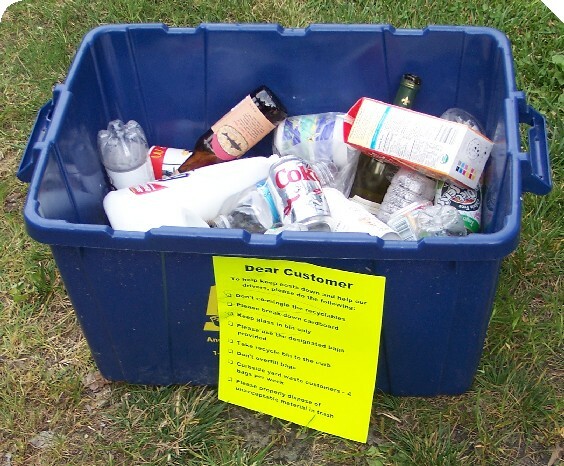 This is the first season that curb-side recycling has been collected in Rehoboth Beach. Photo courtesy Capt. F. Kurt Perl, Divemasters, Inc. The Atlantic Surveyor continues its work charting the ocean floor. Its crew has been working almost non-stop for the past couple weeks between Cape Henlopen and Indian River Inlet. Divemasters, Inc., out of Toms River, NJ, owns the survey vessel which is under contract to NOAA and SAIC. Capt. F. Kurt Perl of Divemasters says NOAA contracted the company to conduct sea-floor mapping of various sections of the Mid-Atlantic coast for the purpose of updating nautical charts and to verify "least depths" and positions of known and unknown wrecks or obstructions. The research vessel employs a side scan sonar which is towed behind the vessel and a multi-beam echo sounder which is mounted on the bottom of the vessel. For the past three summers, Capt. Perl says the crew has been working its way south from the Manasquan Inlet, NJ area and should finish in the vicinity of Ocean City, MD around October. A report by WLNE-TV about the Atlantic Surveyor's mission has been posted on YouTube. 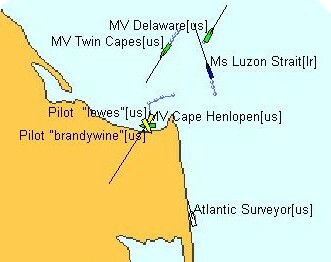 This is a ShipPlotter chart from around noon Sunday showing the Atlantic Surveyor working along the Dewey/Rehoboth shoreline. 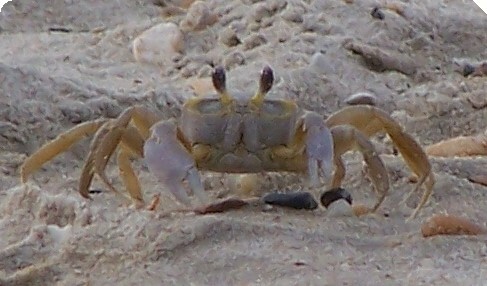 A suspected ghost crab glides across the sand's surface at Cape Henlopen State Park early Friday evening, but never far from its burrow. 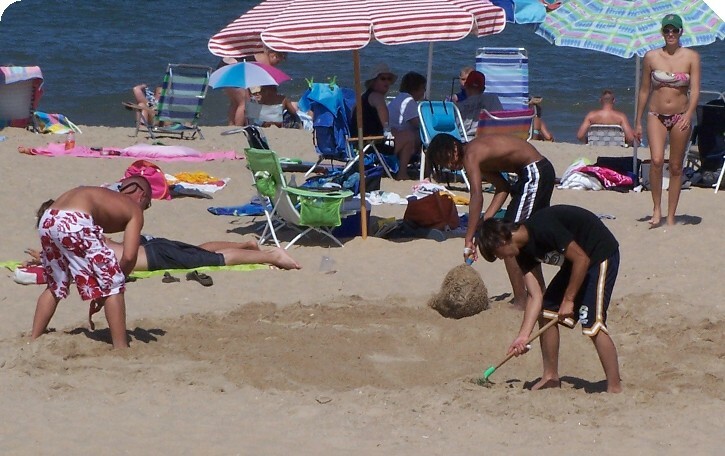 They are responsible for many of those holes in the sand in the less populated beaches. According to Wikipedia, these crabs are called "ghosts" because of their ability to disappear from sight almost instantly, scuttling at speeds up to 10 m.p.h. while making sharp directional changes. 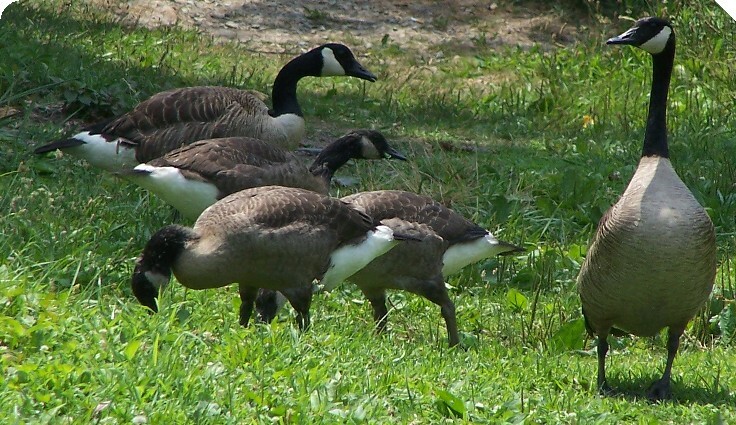 They have two black eyes with 360-degree vision. Ghosts supposedly hold their breath for six weeks during their winter hibernation. Read more about them at Wikipedia.